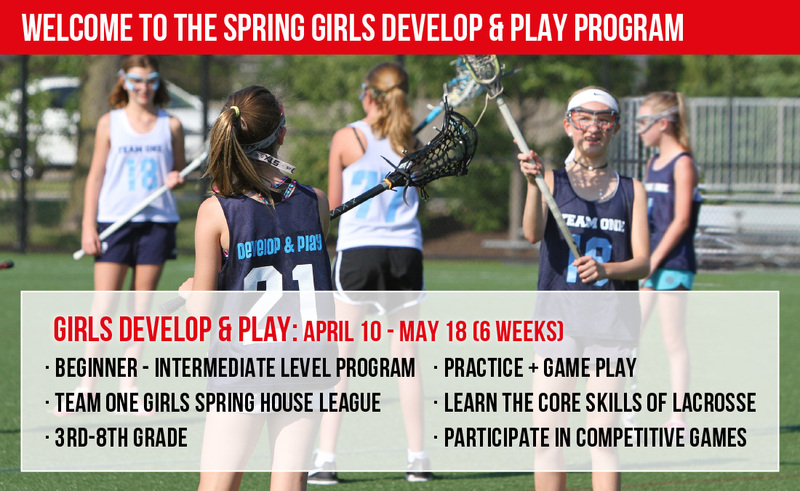 1x a Week Practice + Weekend Games: The Develop & Play program is a Girls’ in-house developmental program that provides players a chance to learn the fundamentals skills of girls' lacrosse in a very organized, yet fun spring season. The Spring Develop & Play season provides weekly team practices along with local weekend league games. 3rd - 8th Grade Girls (High School Graduation Years 2023 - 2028). This program is recommended for players with Beginner & Intermediate Experience. Develop & Play is Team ONE’s Girls’ in-house developmental program designed to teach players the fundamental skills of girls lacrosse through quality training and organized league play. Run by seasoned Team ONE Girl’s Directors and trained coaches! No parent volunteers. Low Coach-to-Player Ratio: Individual attention is the key to player development! Equipment: Players will need a stick, mouth guard, and goggles. All players will receive a girls Develop & Play Pinnie! We thank our local Park Districts for the great relationships and support in order to help us provide the best quality Spring lacrosse experience possible! CLICK HERE TO REGISTER FOR 2019 SPRING BOYS DEVELOP & PLAY!